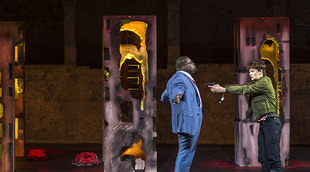 In Peter Sellars’ new production of La clemenza di Tito, whenever Sesto says “traditor” (“traitor”) in his end-of-act-one recitativo accompagnato, the supertitles read “terrorist”. This may seem like a small detail, but it’s emblematic of Sellars’ and Currentzis’s audacious reworking of Mozart’s opera. Sesto’s treason is personal, a crime against his friend and father figure Tito. Terrorism is general—the aim is to create fear among the masses. Sellars wants his Clemenza di Tito to be broadly political, and interpersonal melodrama is the first casualty. Gone are most of the recitatives, including much of the relationship-building between Vitellia and Sesto and all of Sesto’s and Tito’s climactic second-act interview. (Gone, even, is the intimate, pathetic trio “Quello di Tito èil volto”.) Instead, choruses from Mozart’s Mass in C Minor (K 427/417a) are spliced into the score to show the collective impact of the opera’s events. Tito’s generosity is greeted with the Benedictus and Hosanna, his shooting is mourned with the Kyrie, and his mercy is implored with “Qui tollis peccata mundi”. The chorus responds to his death at the opera’s end with the Masonic Funeral March in C Minor (K 477/479a). The political message of this staging is modern. Tito is the head of a (mostly black) government that has rocky relations with the (mostly white and Muslim) public. His beloved Berenice, whom he must send away to secure popular support, wears a hijab. (It’s unclear why he can’t marry a Muslim; his marriage to Servilia would also be interracial in this casting.) When Vitellia pushes Sesto to assassinate Tito, he does so by joining a terrorist cell. While he ultimately shoots Tito with a gun, he goes on his mission wearing a vest of explosives, and his accomplices bomb the capitol. In a revision of Metastasio’s plot, Sesto attacks the right person. He fatally wounds Tito, who sings the second act of the opera from a hospital bed. Ensembles and choruses feature highly stylized, matching gestures—reaching to the sky, clutching the heart, falling to the floor. (There is lots of anguished rolling on the ground.) Sellars’ choice to eschew naturalism fits his larger scheme: this isn’t about individuals and their conflicts, but rather society as a whole. To the extent that bold musical and staging decisions serve the overall vision, I respect them. However, there are missteps. Giving Servilia “Laudamus te” from the C Minor Mass (in response to Tito’s acceptance of her relationship with Annio) merely slows the pace of the drama. The C Minor Adagio and Fugue (K 546) is far too long for the staging it accompanies: Sesto and his accomplices quickly finish arming themselves for their attack and then spend much of the music waiting around. Sellars’ lack of faith in the recitative (“the dead weight and musical tedium of the Metastasio/Süssmayr axis almost kills the opera”, he writes in program notes) was reinforced by the dragging delivery of what little recitative remained. Supertitles that didn’t match what was being sung (instead offering words that more closely fit the directorial concept) jarred, as did minor recitative changes (particularly one that broke Tito’s final rhyming couplet). Even if everything in this review so far has horrified you, this is a Tito worth seeing for the quality of the cast. Mezzo-soprano Marianne Crebassa sang Sesto in a voice capable of sweet tones but cored with steel. Smooth legato and clean super-speed triplets made both “Deh, per questo istante solo” and “Parto, parto” musical highlights. 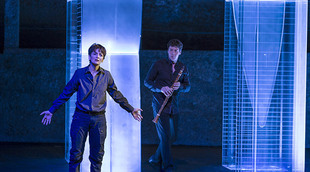 Credit for “Parto, parto” is also due to the solo clarinetist Florian Schuele. Not only did he play his tricky part with great tone (and added ornaments to mirror Crebassa’s), he did so while sneaking among set elements, lying on the ground, and being shaken by Sesto. Vitellia was not onstage: all of Sesto’s angst and pleading were directed to Schuele, who proved an excellent actor and scene partner. As Vitellia, Golda Schultz sang in a round, ringing voice. Her scraped-out lowest notes of “Non più di fiori” were lost in the accompaniment, but that was a small price to pay for a bright middle range and effortless top. Schultz made Vitellia’s rage and remorse palpable as she kicked and threw the flowers and photos from the vigil for Tito. The chorus “Che del ciel, che degli dei” was directed at her as much as at Tito, and she reacted in moving horror to the crowd’s misplaced adoration. Soprano Christina Gansch sang Servilia in a light, clear voice with precise coloratura; the only excuse for the inclusion of “Laudamus te” was that it let us hear more of her (in music that suited her better than the too-airy “Se altro che lagrime”). Soprano Jeanine de Bique was a surprising casting choice for Annio (usually a mezzo role), but proved effective. Her tone was richly colored throughout her middle range and soared on her stratospheric ornaments in “Tu fosti tradito”. Sir Willard White sang a gravelly, booming Publio. Russell Thomas’s tenor was huge for the part of Tito, but surprisingly maneuverable in spite of its size. While his voice sounded good in the role, its heft worked against the conceit that he was dying for half of the opera. The musicAeterna Choir of Perm Opera created a full, intricately layered sound in their many choruses, both original and supplemental. Teodor Currentzis’s conducting of musicAeterna of Perm Opera was both dramatic and self-indulgent. Tempi were extreme, from a breakneck overture to crawling renditions of the choruses “Ah, grazie si rendano” and “Che del ciel, che degli dei”. Currentzis luxuriated in ritards and pauses. The length of the appogiaturas in “Ah, perdona al primo affetto” bordered on tasteless, and “Parto, parto” included many long stretches of silence. Such daring choices had great dramatic effect at first but lost their power with repeated application. Currentzis was presumably also responsible for the very heavy ornamentation of all arias and duets. This decision was persuasive, thanks to a cast full of flexible voices and ornaments that tended to reinforce the emotions of a piece (rather than merely showing off the singers’ abilities). 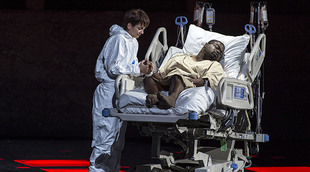 Sellars’ and Currentzis’s version of Tito tells a compelling story and serves as a timely call for dialogue and mercy in response to violence. In doing so, it loses the specific dramatic drive that makes Mozart’s Tito my favorite opera. I still enjoyed this music, this staging, and these performances immensely. They’re just a different Tito—and Mozart’s original Tito is the one I’m in love with.